I only heard this romantic story on Tuesday evening on youtube and again found it today on OMGUBUNTU. Link below. But apparently an interim release of Ubuntu destroyed the latest model of Lenovo laptops. This included the Lenovo Yoga line. The laptop series that this happened on was marked down for Christmas. The laptops are now no longer able to save time and date settings a long with a host of other settings effecting user hardware. This essentially makes the laptops useless. Canonical and the Ubuntu team seem very upset and want to get to the bottom of the issue, but it appeared yesterday that Lenovo just didn’t care. Lenovo told one user in the forums to simply get a new motherboard and this was said in a way that seems they didn’t bother to test their laptops at all before they released them. If the BIOS on the laptops are indeed borked up, this would mean that inadequate testing went into their product before it reached the shelf. I’ve made mention of Lenovo in the past and it wasn’t all good. Take care this Christmas when buying devices. Read documentation fully and never get anything just because it is free or on sale. One source on the issue even said that Lenovos were in his opinion “cheap”. It is possible for users to currently flash the BIOS and reinstall a working copy or an updated version, but this is not something that just anyone knows how to do. Not to mention, it is a cliffhanger, it takes time to work and you have to wait for it to finish before rebooting and testing the status of the device. If this happened to me, I would personally try pulling the CMOS battery and leaving it out for up to 5 minutes and seeing if this fixes the issue, if not, it may be an issue with the BIOS firmware itself, in which case, you’re better off trying your luck flashing the BIOS. I have successfully done this in the past, I may even make a tutorial about it in 2018. Ubuntu has said that there is a fix on the way though. Supposedly a new image of the distribution with an updated kernel and drivers would fix the issue, but OMGUBUNTU warns that it won’t fix those computers that already got borked up. An article on thehackernews confirms Windows 10’s newest update brings Keeper password manager which apparently steals users’ passwords. The app is one of many apps that are possibly being installed in secret, forcefully upon a user’s system without them even getting an alert. This package doesn’t install with system updates, but Microsoft does suggest it. Obviously, Microsoft thought it was a good idea to press their affiliated apps upon people now, because making money through bing and Windows 10 purchases isn’t doing it for them. Apparently the app hasn’t been updated in a year either. A researcher from the Chromium project recently analyzed the app and found that a critical flaw different from one that he himself reported finding in an associated plugin over six months ago. As of right now, I would strongly urge users to not try using the password manager anymore and if you haven’t already, refrain from doing so. There are more well known alternatives such as LastPass. However, there does seem to have been an update released on the 11th of this month which removed the said vulnerability. Still for a company to let such a big issue pass quality testing in their app and for a big name company to trust such a company that would add more holes to their already existing millions is beyond me. This is not new behavior for Microsoft though. This is just their new business model. Viruses are annoying, often misdiagnosed and some are hard to find. Like Viruses in the body, computer viruses are seemingly invisible and self replicating. Viruses are encompassed in the term Malware, however, malware isn’t always a virus, it can cover anything from Spyware, PUP and Rootkits. While not all malware is the same, it is important to stay vigilant in your routine maintenance and security on vulnerable systems, because each one brings its own bad behavior. Whether you’re a technician or an average computer user, here are some tips on how to deal with the threat and stay safe, also a list of common infections. TROJAN- Trojans use the disguise and conquer technique, they are often bad software disguised as good. The trojan usually grants outside persons access to a machine(may include payload). ADWARE- Usually more annoying than harmful, though some adware can contain viruses and spyware. Adware is tricky for some antiviruses to remove because it doesn’t often directly harm a system. Adware tracks users over various sites Some free software includes adware. ROOTKITS- Rootkits are typically planted in a hidden system folder like System32 or something similar. They usually are quiet, but they do make changes to system boot files and the like. Rootkits are often unseen by antiviruses, but they can make your life hell. They can even cause you to lose data to other individuals. PUPS- These programs are usually installed in the form of a free trial, or maybe they come bundled with other software. They are usually unwanted, but sometimes not directly harmful to your system. Antimalware can often find them, Malwarebytes is good about this. SELF-REPLICATING VIRUSES- These buggers can replicate and infect more systems that way. Certain Viruses can attach themselves to every file in your system and encrypt or overwrite the file much in the way the Sality virus did. Viruses can create botnets, but often they steal data, cause high cpu load for no reason and pretty much overwrite your system files to run their executables. WORMS- Worms are often pretty insidious. They can contain payloads which do more than they do. They burrow their way in much like a worm by finding holes in software and operating system security. They travel across the network from device to device. Much like viruses, worms can multiply, however, unlike viruses they do this independently. SPYWARE- Spyware is often used to track anything from browsing habits to keystrokes. Spyware can be spread via other software. It can make changes to hosts files and network settings. Spyware can often steal user login information when a user merely opens a browser with saved passwords or logs into their accounts. Sometimes Adware uses Spyware to steal data or spy. BOT- Botnets are often a network consisting of various computer or internet connected devices in a “zombie” state, being controlled by malware to randomly ping servers in the hopes to bring these servers down and collect ransom from their owners. Bot malware creators don’t care about you, they only want your device and bandwidth. People have gotten in trouble with law enforcement due to their devices being part of a botnet. BUGS- Often this could include what are known as exploits. Bugs are often discovered as missing or incorrect code in a piece of software and this can range from alterations in expected software behavior to damaging security holes that allow attackers to gain access to other parts of your system through the use of this software. While exploits are usually thought of as in a browser, they can indeed be considered bugs in other software as well. Whether you have any of these types of Malware or not, it might be a wise idea to run frequent scans on your system. Often users might not know where to look, but learning where to look for these files can make removal more complete and easier in the future. Often antivirus software is recommended, but antivirus software can only detect what it knows about. Usually antivirus software relies on definition updates which happen sometimes twice a day. Antimalware is often a completely different piece of software for removing leftovers. Antivirus and antimalware solutions have adapted to ridding the system of more and more widespread types of malware. Neither only works on trojans or PUPS anymore, both work on Viruses. But often antimalware like Malwarebytes is good for getting up whatever popular antivirus solutions miss. I often run this application first. What makes Malwarebytes different is that they study and work on more services and apps outside of their antimalware. They usually are like first responders. They typically know what other antimalware companies know when they know them. They acquired Hpguru hosts in an attempt to further harden their website based exploit and malware blocking. They acquired other tools that were not well known. They used these tools to learn new ways to remove and clean infections. Malwarebytes has always been the best software that I have ever used at removing infections from my PC, but they are now even better. Malwarebytes started out with less features, but the same great signatures. These signatures were often updated faster than antivirus definitions. They now include an antiexploit, antirootkit and shields which protect users from intrusion. They use advanced heuristics in a way beyond antivirus as antivirus still has issues with this. Adwcleaner is another tool that was recently acquired by Malwarebytes, but it searches the registry for common malware keys and related browser extensions associated with malware. It then removes the folders that the registry items point to as well and reboots the system to enforce the changes. Adwcleaner is a very simple, yet very powerful tool for removing things that antivirus software doesn’t get. This is often my second scan. Portable. Junkware Removal Tool(JRT) is a tool in Malwarebytes arsenal that digs deeper in the system to uncover stray registry files, empty folders, leftover pieces, maybe even certain types of toolbars. JRT was discontinued as of October 26th 2017 by Malwarebytes. Adwcleaner does many things that this does, but then so does Malwarebytes now. Portable. Superantispyware is older than Malwarebytes. It seems that this application has been around forever, in recent times it has kept itself relevant. Superantispyware has shields as well that monitor installation of new software. Often this antimalware is best at detecting Trojans, but it also deletes tracking cookies and some forms of adware also. Offers a portable solution. TDSSKILLER is an antirootkit actively developed by Kaspersky labs, a Russian antivirus and antimalware company. Kaspersky solutions might cost a rather descent amount of money, but for the price, you do get remarkable protection. Kaspersky can uncover a broad range of malware. Their rootkit uses their reknown heuristics to search in folders and system files often associated with rootkit installations. A good thing to keep in your toolbox. I usually scan with this after Superantispyware on a really infected machine. Portable. Emsisoft Emergency Kit is a free removal tool by the creators of Emsisoft antimalware products. This powerful tool should have topped the list. It scrubs deep with a regular file search and then also runs an antirootkit check. It also has other tools such as a hijackthis type tool for those who remember and a registry scanner for malware traces. Truly a remarkable tool for removing malware in tough to reach places. I often run this first, but It’s hard to top Malwarebytes. This is a portable solution in case you don’t want to install Malwarebytes to your pc. RKILL An application that runs stop or kill signals on other applications. This tool is good for a highly infected machine, because it often seeks out only malware and stops it. Sometimes it may stop other unimportant system services from running, but nothing significant to running the machine. It often allows the user to halt malicious processes that prevent him/her from accessing Malwarebytes or other malware removal tools on this list. It is sometimes key to saving a computer outside of safe mode with networking, however, I believe this tool can be ran in safe mode as well. Portable. This can help with backing up or copying important files from your hard drive. Malware changes the Hosts file, so replacing the current one with this after an infection is a great idea. After this, copy and paste the contents from the new hosts under the above two lines. That’s it. Don’t open email links unless you are sure of their validity and try to acquire a router with a descent firewall. Most routers these days have a good firewall and most homes have a router. To access the router configuration page, read your router’s documentation that came with it. Once there, it’s usually under security tab or firewall. Just enable it. When following this guide, you will need to reboot your computer to make the changes permanent. I don’t recommend doing this after each step, but you can if you wish. Please know that sometimes restarting after each step gives the malware the chance to change system files or boot files that are vital to your system before it has been properly removed. This could allow a half removed imfection to come back. For this reason, I recommend only rebooting once after each step in the list is completed. Treat each application in the list as a step. https://www.bleepingcomputer.com/download/windows-repair-all-in-one/. This tool tries to restart halted Windows services and reset permissions, among other things. Oh no we’re not finished yet. Delete old system restore points. Go to Start> Control Panel> System and Security> System and then go down and click the desired disk, in most cases this is C: the one with the Hosts file on it. Go down again and click configure. This will open the system restore window and just go down and click Delete. This will properly delete all current restore points. It might also be wise to create a new one at this time. You may also want to run your Windows disk cleaning program as well. To do this go to Start, on older systems use the left Window key + R keyboard buttons and type cleanmgr. Click the icon with a brush ontop of a hard drive and check every box in the available list after it populates. Click ok. Click on the button to delete files and then wait. Once this finishes you can optionally reboot again and then you’re finished. Have a favorite tool not mentioned above? Share! Overclocking one’s computer is often the cheapest and most fiscally sound way to get the most bang for your buck when it comes to PC hardware. In the computer world, retrofitting things, engineering new ways of doing things, these are often encouraged, however, when it comes to overclocking to get a small amount of extra speed out of an aging PC, you probably would be better off just saving for a few years and getting a newer model of CPU, RAM and even Graphics card. On legacy hardware, it is sometimes impossible to even find the settings in the BIOS to do it. Often times, to overclock a PC, custom BIOS are used to achieve this. Overclocking the hardware is normally done in small increments and is usually stopped when the right balance is found between hardware overclocking and throttling is found. Usually the one overclocking the machine knows what he/she is doing and they realize that overclocking could not only void their warranty, but also could reduce hardware life. Another problem with overclocking, the person who maintains the machine that is overclocked has to know what temperatures are acceptable for their hardware. It’s often not a good idea to run certain AM2 chip CPU’s over the 70’s or 80’s range of temperatures, each CPU is different in this regard. Therefore, knowing exactly the right temperature is a must. Certain temperatures at or above this range depending upon your CPU can cause throttling or even cause a safety protocol put in place by say AMD to shutdown the system. This is the system trying to save itself. Many such protocols have to be taken into account and have to be more or less ignored to successfully overclock a PC. Overclocking can be reckless and even stupid if you don’t know what you’re doing. Assuming that you get your BIOS flashed with a custom BIOS, you’re more or less aware of what overclocking is or are about to either upgrade your hardware or overclock it. If you’re overclocking, an absolute must is to at least use water cooling. Water cooling is actually a rather expensive way to cool a CPU down way better than stock. This in itself can often give you better performance, but it is costly and it does require a lot of hands on maintenance. A final point is the amount of power. Power consumption increases considerably when using a CPU or several sticks of RAM to its fullest capacity. When overclocking a PC, one has to be mindful of the voltage running to each component of his/her computer. This can get messy and tricky if you’re new. This is why I would never do it myself, nor would I ever recommend someone doing this to save a few bucks at the current time. Find lighter solutions for your problem. Often is the case that these days, computers are being over worked. Windows and some of her backdoor programs often can take 100% CPU in the background when you’re not even using the computer, not to mention malware and viruses. Add to this overclocking and you have a computer that wastes and ages before its time. RAM is often a cheaper option when it comes to upgrading a PC and I highly recommend someone to do this first before overclocking. Check your current RAM and follow the same or similar clock speed in MHz. Often in DDR2 and DDR3 and others, there are numerous clock speeds for new RAM modules. Just using any piece of RAM lying around that has the same number of pins might not always be best. If your computer’s RAM says 533MHz, I’d stick with that. However, upgrading from 2 GB to 4 or even 6 if your motherboard allows, can address many slow down issues you might have had. Also, some CPU’s for legacy hardware may not be as expensive as they once were brand new on Amazon. I don’t recommend just anything on Ebay because without testing, you really don’t know what you’re getting. One more piece of advice, when money is hard to come by and you can’t readily afford either of these options, switching many of the programs you are using, possibly switching to Linux would be your best bet. If you’re already on Linux, using a lighter desktop environment or changing office suites to something lighter, even changing Chrome with a lighter browser can make all the difference. PC manufacturers put the numbers and clock speeds on different hardware because they know it will work at this number. They do that because they have tested it to run at these minimums. Even if your hardware could handle more heavier loads for longer periods of time, it is best to be left to do what it does best for you on its default settings. Computer hardware changes almost as often as the software does. This usually takes place every two to four years. This doesn’t necessarily mean that you have to run out and pay a lot of money on a new machine already built. Certain computer repair shops and thrift stores can sell you a descent machine for cheap and a four to five year upgrade cycle isn’t such a hard thing to do. Merely changing out a fan or adding a couple of RAM modules can do so much. Also, SSD’s aren’t a terrible investment. Windows ME, a.k.a Windows Millenial, was a Microsoft operating system released in late 2000. It was a continuation of the model started by 95 and 98. Windows ME came a year later than Windows 98 SE or Second Edition which really didn’t bring a lot of noticeable changes to the desktop, while Windows ME is bit of a revamp in some areas as we’ll see. Windows 2000 was released several months before, but it has little to do with ME, 2000 was more server related and for Enterprise. Windows ME did get some system sounds and other improvements from 2000 though. Windows ME was one of the first iteration of Windows OS to come with an automatic update feature. Windows ME’s desktop came with enhancements derived from 2000 and Windows ME was supposed to eventually move from the old 9x kernel to a NT kernel, however, this never happened so the whole thing was rushed and the next year saw a completely new OS in Windows XP. Other important changes from the era of Windows ME were updated built-in applications and shell improvements. Also on the list of improvements, Windows 95 and 98 were slow at booting, Windows ME made changes to attempt and rectify that by cutting down on how often the registry was loaded, Parallelizing enumeration of plug and play devices, bypass of cetain config files and even a few BIOS POST changes. As I said earlier that Windows ME had an improved interface, a new version of Windows Explorer was used, and icons in the notification area were supported in 16 bit color. Windows offered “special folders” in their start menu. Task bar had a new disable drag and drop feature to prevent moving of the task bar. A few new things included in Windows ME aside from the before-mentioned autoupdate feature, was a net crawler, Windows 2000 network stack, System Restore, System File Protection, SCANDISK, and of course, their requirements for system hardware also increased. A minimum RAM requirement was for 32 megabytes all the way up to 512 addressable, 500 megabyte hard drive space, fat-16 to 32 file system and a 32 bit cpu. Moving on to Windows XP. Released in 2001, this iteration of Windows Operating system offered the new NT kernel, fat-32 file system, more polished graphics and themes, Windows XP had an automatic update feature much like Windows ME did, but it was so abysmally slow. Seemed as if it got even slower around the end of life. Windows XP offered internet Explorer 6 among its upgraded packages. Internet explorer was replaced by Firefox later in 2003, but that’s not we’re talking about. Windows XP was released initially as a 32bit operating system, but later released a 64 bit version. Windows XP had two ways to update, the updater application or through an online updater. Windows XP included the product activation application in its early beta, but this carried over to the final product. Windows XP interface was enhanced over that of ME by the use of drop shadows, alpha compositing and visual styles all determined by the operating system based on processor power. The original wallpaper and color scheme was often blue and green. Windows XP offered under the hood color and clear type changes which for many made it easier to read. Several inclusions were in this release of Windows, CHKDSK, Disk Defrag, Shadow Copy, now you were able to edit the registry with a builtin registry editor. Group Policy was added for more control over file access in a company setting. A firewall was added as well as network sharing. Windows Xp also received updates to its restore and recovery, it also had an update in error reporting, this was to help improve stability. Windows XP did have some programs removed, a few of these were builtin, but many people could simply just download third party and add their functionality back in to the system. Windows XP offered three separate service packs. A service pack is merely a set of updates for Net. Framework and other builtin applications as well as modifications to OS security. In two of the three service packs, more items were removed by Windows. With the release of a service pack, the system requirements did get increased as well. Windows XP was the longest running Windows OS to date, with support finally ending April 8, 2014. XP had a very loyal following, it was also arguably one of the best operating systems of its time. XP was also the most patched as it saw patches for over thirteen years. You would think in that time that Microsoft would have gotten it right. Windows Vista, another rushed iteration of Microsoft Windows,was released worldwide in 2007. Originally codenamed “Longhorn”, Vista offered many good features albeit it ran through so much RAM that no one could comfortably run it on their system. Still, Vista was an improvement to Windows XP. The time between XP and Vista was also one of the longest between Windows versions. You’d think it would have been ready by that time. Windows Vista was the first to offer Aero, a Windows theme which added makeup on to Windows XP’s beautiful, yet dated look. Windows Vista Microsoft’s big goal to increase security on Windows. Another thing about XP is that it was very susceptible to malware infections. It seems that even I was cleaning my Windows XP computer ever week, but often it was my own fault. Windows XP brought more choices in browsers and other software, so it’s no surprise that it brought on more bad guys writing code for it, often these pieces of code were embedded in a website, sometimes embedded in videos on unsavory adult sites as well. The early 2000’s were a huge time for getting Trojans and replicating viruses. Windows Vista added patches and service packs to try and prevent some of that. Another big feature added in Windows Vista was User Account Control. What User Account Control did was to ask the user each time a system file was accessed and I mean everytime. It didn’t differentiate between the user accessing the file and another third party file accessing it. User Account Control offered three main settings, Low, Medium and High. Many users of Windows decided to stick with Windows XP due to the rushed initial release of Windows Vista. While Windows 7 did offer a more stable system once it was released, some users still waited. Some users didn’t have the requirements needed to run Windows 7 and didn’t want to go out and purchase a new and expensive computer. Microsoft ended support for Vista on the 11th of April, 2017. Windows 7, the newest and most polished version of Windows released since XP, Windows 7 was released in 2009. Two short years after the rushed release of Vista. Windows 7 promised better usage under more modest requirements and carried over all of Windows Vista’s security enhancements. Windows 7 is currently supported until 2020, however, in a marketing scheme, Windows did try to convert everyone’s installation of Windows 7 to Windows 10. Personally I think this was a bad idea. Windows users should be able to choose rather than be covered up in Windows advertisements worse than adware that many of the applications they install on a Windows desktop are meant to protect against. Windows 7 like Windows XP came in multiple editions, but Windows 7 came in up to six. Starter, Home Basic, Home Premium, Professional, Enterprise, and Ultimate. Each edition aside from Starter included a 64 bit version, however, for Home Premium, if you wanted to gain access to a 64 bit version, you might have to get that separately from Microsoft. All editions included most of the features and software you’d need on the system, regardless of which edition one purchased, but to access a more feature rich version, you’d have to use something Windows 7 introduced called Windows Anytime Upgrade. This concludes Episode II of this series, I will continue on to Windows 10 after New Years. Happy Holidays!! I am a 90’s gamer, pretty avid, yet still very average. I didn’t spend all my allowance at the arcade. I spent most of my weekends at home playing Nintendo the original console with the likes of Super Mario Brothers, Dino Wars, etc. I would often stay up an extra hour, sometimes two or three hours playing these games. For their 2D graphics and 8-bit beats, they were still very mesmerizing to me. Dad would sometimes play with me, but honestly, I had about as much fun by myself. I had a Nintendo console before I even knew what a computer was. Sadly, I gave that console to some less fortunate kids in the neighborhood, but I didn’t feel too bad about that, it was close to Christmas. I finally got my first computer when I was 15, about 2002. I stayed on it often, night and day, gaming, looking up music, back in the day everything had a free site somewhere. I was running Windows XP like many people were at the time. I didn’t have a clue what Linux was. Most games got bloated and wouldn’t play on that machine. At the same time, I was getting viruses off of it every week. I am surprised it lasted as long as it did. I rebuilt it, but it kept aging and things kept getting more advanced and complex for it. Browsing became more of a chore for that system, but it did it right up until the last, never questioned me. As I transitioned to newer hardware, I became engulfed in Windows 7. This is where I learned more and more each day about how things worked. I wrote Batch files to tinker with system settings under the hood, I wrote little fake viruses to prank people, I even started college under the umbrella of Windows 7. I became fairly proficient in fixing my own issues and learning coding, I even played around with Linux a few times during those days, but it wasn’t until I was in my 20’s that I chose to stick with Linux. I learned steadily everything I could, I didn’t gradually migrate over either, in a few days, I had most if not all of the essential commands that I absolutely needed under my belt, I jumped right in. Every computer in my house became a Linux system. About that time, Windows 8-10 came in with their new telemetry stuff. I didn’t need them anymore, I had everything that I needed right at my fingertips. Obviously Ubuntu became a bit dated for me, so I moved to Arch, now I can’t even go back. Gaming nowadays is a bit sparse for me, but what games I do play tend to emulate older Mario’s Brothers type games mostly. I go to an arcade every now and then now. But most of the time, I have my head buried in code, an article about technology from ghacks and ars technica, to just testing out software and reviewing it in blogs. I am still and will always be a 90’s kid at heart though. 8-bit will forever be my jam. Aibo, the robotic dog sold thousands online at its first inception back in 1999. Aibo sold out quickly, but as production continued, the consumers’ interest waned because of such a hefty price tag. The new and improved Aibo is said to come with artificial intelligence and can learn new tricks just like a real dog. The robotic dog is cute, adorable even, but the price tag is still bigger than the dog is. Aibo has downloadable extensions to its personality from an online store, but the owner must sign off on the downloads first. The robotic dog is said to be eager to learn what makes the owner happiest and to continue performing these functions on a daily basis. Aibo could be a great new addition to anyone’s home if he/she likes small dogs and wanted one but certain restrictions such as terms of lease and other situations prevent one from owning a living dog of their own. Aibo is set at a whopping $1,740 price tag, but with the newest upgrades, it is expected to make bank this year. Aibo can take pictures when asked by the owner and can video record everything it experiences in unknown terrain for later browsing by the owner. It can create a database of living memories with the owner. Sony is attempting to compete with Google and Amazon with their smart devices. They hope that the robotic dog will be capable of doing everything that the Echo and Alexa can do now in the future, but for now they are settling for a robot dog to make people happy. The robotic dog is set to sell in Japan in January. Sony is mostly known for their TV’s DVD players, Blu-ray, other devices such as these, they are hardly remembered for their tinkering in the world of robotics, but now they are trying to reach more avenues with electronics. It is a good thing to see, a company doing this for robotics in general. It would be nice to see more things like this down the road, I will keep track of this project as well. I will also leave random, short updates here and there of the progress as I come across something interesting. Vivaldi Technologies, a company based in Norway, is the company behind the Vivaldi browser. 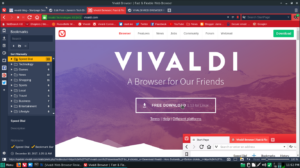 The Vivaldi browser was built with Power users, or technology enthusiasts in mind. It has all the features of Chrome, Firefox, and others with a little something extra. The browser is best suited for people who know what they want, how they want it. Vivaldi started out with a Tech Preview and since its beginning has ran more like a stable release. The browser was meant to replace Opera legacy. It was built in the wake of changes in Opera Software, the changes that Jon Von Tetzchner, didn’t agree with. He was mad after Opera shut down their old community website and he felt that Opera the browser was no more, he felt that the company sold out and so he left Opera and reopened the community site and started to form Vivaldi. Vivaldi has more built in features than you might really think is necessary, however, where they are heading, these features will come in handy. Vivaldi is an unfinished product, but a very sturdy one. Vivaldi uses Blink, the latest Chromium engine and many of its libraries. Say what you might about Google, but next to Firefox, they have done the most to advance the web. Vivaldi uses a closed source UI which has some people questioning its loyalty to its users, however, Most of what Vivaldi have advanced since releasing the browser has been Merely to the UI and not the inner workings of the browser. Changes made to the UI were adding of tab stacking and audio control in active and inactive tabs, Vivaldi’s own theme support, the ability to switch the placement of the bookmarks bar, the side bar, etc. and more control over browser history. They also added possible hotkeys and mouse gestures. Vivaldi browser stays up to date with the latest Chrome updates. They do not lag behind like with browsers such as Srware Iron and they do not add hidden proprietary software like with Comodo’s browsers and even Chromium itself. Chromium is the open source project behind Google-Chrome, this means that Vivaldi is largely open sourced, the company just likes to keep a lock on their interface. The browser looks reminiscent of Opera in its earlier days, back when the company was loyal to the community it started with. Vivaldi does listen to its users, it may take time to implement much wanted features, but they do try to make good on their word. Vivaldi has recently started a personal blogging site on its community page for its users much like blogger for google. They have also released an online email client, but I have yet to verify how well it works. They are also currently working on a sync feature, this will put it at a tipping point agains Chrome, many users who feel stuck on Chrome will now have two browser options to move away from Chrome to. As for privacy, the browser does allow some data collection to Google, but this is just standard for features such as safe browsing and these can be turned on and off in the browser’s UI easily. Vivaldi is quick to render pages, feels even quicker than Chromium, however, that could be placebo. Vivaldi supports nearly all of the Chromium extensions now. One issue I have with Vivaldi, it takes longer to fire up than even Google-Chrome does. Loading the browser requires a bit more CPU cycles and time than with other browsers, however, if it remains constant and stable, that might not really matter to new users. It looks and feels amazing as a browser. The browser’s slogan is “It’s your web. Surf it the way you want” as printed on their site: https://vivaldi.com. As you can see, I have their homepage opened now which displays many of their unique features over other browsers right on the front page. It also gives links to the Community page, the news, the forum and the webmail. Here is to Another great year with Vivaldi, let’s hope the next year finds even more improvements.